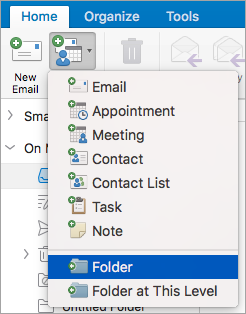 Select a folder at the same level where you want to create the new folder. From the Home tab on the Ribbon, click the New Items button, and then choose Folder at This Level. The new folder will appear as Untitled Folder, with the name editable. Re-title it by typing the new title in the text box. Select a folder in which you want to create a new folder. From the Home tab on the Ribbon, click the New Items button, and then choose Folder. The new folder will appear nested in the folder you selected in step 1 as Untitled Folder, with the name editable. Re-title it by typing the new title in the text box. Select the folder you want to delete by clicking on it to highlight it. From the Home tab on the Ribbon, click Delete. 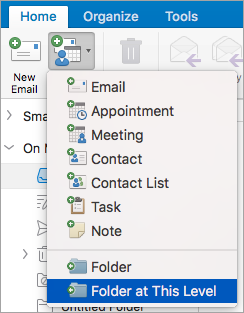 In the navigation pane, click Mail , Contacts , Tasks , or Notes . To create a sub-folder, select the folder under which the new one will be created. Select Organize > New Folder. The above procedure explains how to create a subfolder of an existing folder. 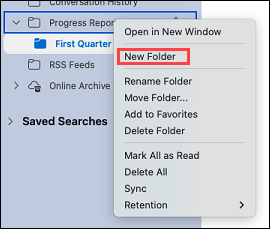 To create a folder on the same level in the hierarchy, select a folder, and then press SHIFT + OPTION + + N .
Double-click the folder you want to delete. Select Edit > Delete .